When considering who would be most suitable to become "the astronauts", it is worth recalling the political climate of the late 1950s. President Eisenhower had strongly urged that a civilian American satellite be part of the International Geophysical Year, under the auspices of a civilian space agency, leaving the Department of Defense to focus on the development of long range ballistic missiles. 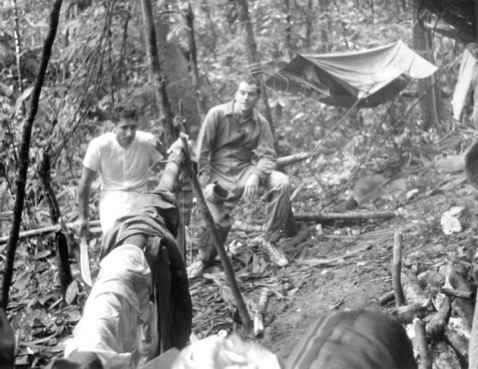 He adhered to a strict division between military projects and civilian "scientific" projects, but by 1958 and the creation of NASA, both the USAF and US Army had (short-lived) plans for their own man-in-space programmes. It seems contradictory that a president who fostered the idea of separating civilian and military space goals to different agencies would also decide that the first American astronauts for the civilian Project Mercury should come from a military test pilot background. 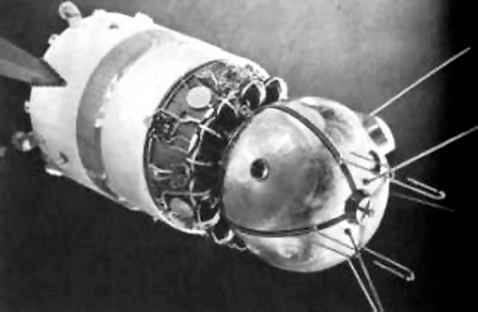 A Vostok spacecraft similar to those that carried the first six Soviet cosmonauts into orbit. At front is the spherical descent module that housed the cosmonaut, and from which they would be automatically ejected prior to landing. with alarm, Eisenhower would have undermined confidence in the United States at home and abroad over their failure to pursue a missile and space capability much sooner. In the two weeks following the launch of Sputnik, scientists held more meetings with Eisenhower than they had done in the previous nine months. In a move to allow scientists more access to national science policy making, the President's Science Advisory Committee (PSAC) was established in November 1957. Though restricted in its activities and influence, seventeen members of the PSAC were selected from the elite of "hard" scientists in the fields of physics, chemistry, engineering and mathematics. They were chosen from members of the National Academy of Science, the Massachusetts Institute of Technology (MIT) Radiation Laboratory and the Los Alamos Scientific Laboratory. This new committee focused on national security matters from the point of view of science and technology and, following the launch of Sputnik, it was tasked by the president with determining the national goals of a future space programme. As a result, the group promoted science-driven space goals over the research-orientated space agency. At the time, a number of leading scientists were apprehensive that intensive political involvement (or interference) in the programme would drive the national space goals towards "programmes [that were] larger than professionally warranted.'' Members of the group also indicated their doubts about man in space as a useful scientific instrument and when asked to prioritise the national goals into a timetable of "early", "later" and "still later'' time frames, manned orbital flight was the final item on the list in the "still later'' category. The group also indicated that it was not wise to focus on space science at the expense of other scientific endeavours and that a balance between space, science and technology was a far more sustainable approach than an all-out diversion of funds to a space programme driven by politics. After he left office as Eisenhower's first Scientific Advisor, James P. Killian (the president of MIT) stated that "many thoughtful citizens were convinced that the really exciting space discoveries could be accomplished better by instruments than by man.'' Recognising the Soviets' repeated use of technology and politics for propaganda, he acknowledged that the Soviet space spectaculars were an intended measurement of the index of national strength, but in the long run, it would be a balance of science and technology (not military might) that would sustain a rewarding programme. Killian argued that although America should not be content with being second best, the national space goals should not be politically driven by the Soviets (or indeed, by the US government). 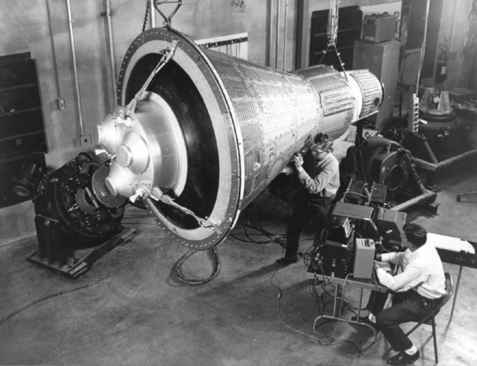 Engineers inspect and test a "boilerplate" Mercury spacecraft. The flight (and much modified) version of this vehicle would one day carry six NASA astronauts into space. part, a comparison between the different views of the president and his would-be successor, Lyndon Johnson. This conservatism was not without its critics, but Eisenhower's "space for peace'' plan won out as, in the 1958 Act, there was no clear military justification for placing a man in orbit. However, air force and army planners (and to some extent the US Navy) were formulating plans for manned ballistic vehicles, large space-based outposts and even man-tended bases on the Moon. All of these were immensely costly and, under a budget-conscious administration, never ventured much further than paper studies, while NASA's somewhat primitive manned programme in low Earth orbit received the go-ahead it needed.